Last night was the full moon and while banishing magic is best conducted during the waning moon, something told me that I should go ahead and clear out the negativity in our home, redo our threshold protection spell, and strengthen the ward currently protecting us. Sometimes it is better to listen to the universe than force the issue later on. I spent the entire day cleaning the house and preparing for the moon to rise. Before you put up a ward or a threshold protection spell, you need to take down your previous ward and clear your home of all negativity. Cleaning is the best way to do this in my opinion. Some people take a more "magical" approach, using spells and charms, but cleaning, cleaning gets rid of the mundane and magical "dirt" while freeing your mind of clutter as well. You want to be sure to clean EVERYTHING. Yesterday I washed baseboards, doors, fans, the dishwasher, under all the furniture, even some of the outside windows. Cleaning stirs up stagnate energy, so cleaning behind and under things helps push out the negativity. Closets, where I didn't clean, I stirred up the stagnate energy by clapping, but you can use a chime or drum as well. Clapping is easiest considering I had enough to haul around into each room. Start at the top of the house and work your way down. This means rooms as well that way you don't have to sweep and vacuum twice. I work clockwise because that is most comfortable for me, but most banishing magical suggests you walk counterclockwise. I can never bring myself to work in the opposite direction. Why? Because I feel counterclockwise pushes not only the negative away, but prevents the positive from entering as well. I find that moving forward and inviting more positive in works best, but everyone is different. Do what feels right to you. I also open the windows in the room I am cleaning as an exit for negativity. No windows? That's fine; sweep the negativity into the next room until there is a window or door for it to exit. Once your house is clean and the energy stirred up, you are ready to put up your threshold protection spell and ward. I put up the protection spell as soon as I was done cleaning. You can use this spell on every door and window in your home if you want, but I feel confident my ward will prevent the bulk of negativity from entering. Furthermore, everyone must enter through our front door, so anything the ward fails to prevent will be prevented at the threshold. My favorite threshold protection spell is from The Way of the Hedge Witch by Arin Murphy-Hiscock. Its simple and quick, just what you need after cleaning all day. Begin by combining the water, vinegar, salt, and lemon juice in your bowl or bucket. Using the washing cloth, completely clean your threshold. Wipe down the front and back of the door and both sides of the door frame. Try to get it as clean as possible. Light the smudge stick and move it around the door frame. Waft the smoke so it touches both the inside and outside of the door frame. Lay the smudge in a heatproof dish and allow it to smoulder during the ritual. "No evil or illness may cross this threshold. I hereby bar it from entering. My home is protected." This symbol is a hexefus which is a combination of the runes Isa (|) and Gebo (X). When written together they "freeze" the state of your home and possessions, protecting them from physical and spiritual intrusion. Finally take the three cloves of garlic and bury them as close to the threshold as you can. I buried mine in a line. One of the left, one in the middle, and one on the right. As you do this repeat the same chant. 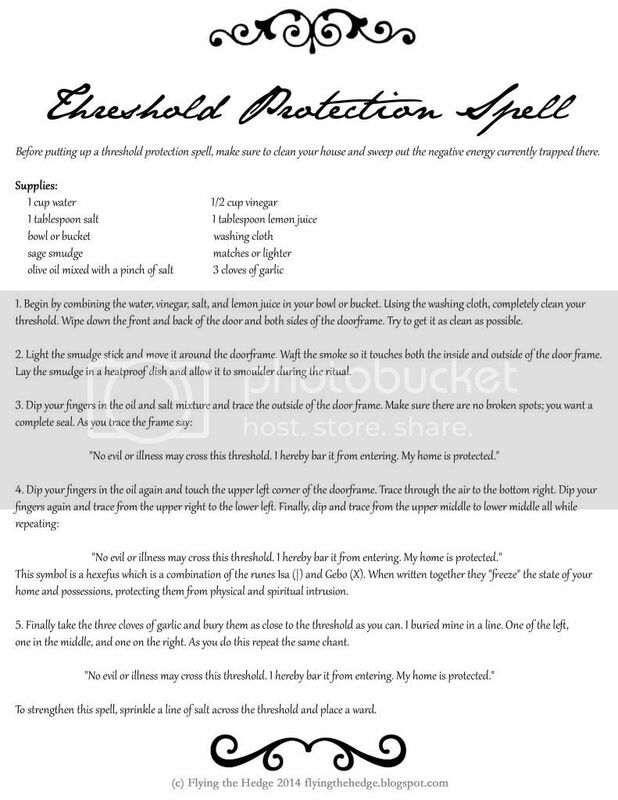 I have used this threshold protection spell at every house I have lived in. It works, but you need to keep an eye on it. Depending on how much negativity is trying to enter determines how long the spell will work. I suggest strengthening it every couple of months, but you may need to redo it every month. My husband is a funeral director and when he has had a particularly heavy load of cases dealing with murder, suicide, and unexpected/tragic loss, I find our threshold weakens faster. Its amazing what you can bring home with you. For extra protection, sprinkle a line of salt across the outside of the door frame. This will further prevent negativity and keep away most insects. I hope this has been helpful. I will post the ritual I use to create my ward later this week. Until then, how do you protect your home? You make it all sound and look so inviting, I wish I believed, it would be so soothing. But alas, I'm an atheist to the core. I don't believe in any Gods or Goddesses either. But I do believe in the power of positive thinking and the natural energy of the world, which are the foundations of witchcraft. My degree is in evolutionary biology so I have a hard time with many "supernatural" things, but I do know that there are things we can't explain and that if we listen to the world around us, you will hear it speak back.